Cupcoats are an eco-chic alternative to the cardboard sleeves typically used on paper cups to insulate your hands from your hot beverage. 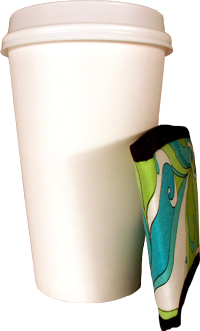 Instead of cardboard or 'double-cupping', add a dash of fashion to your hot coffee and tea experience with a coffee cup sleeve Cupcoat by Cup Couture. Not only are they wonderfully insulating, but our coffee cup sleeves are designed to be used over and over indefinitely. When you don't have time to keep a mug handy or washed, consider using a Cupcoat. Cupcoats help make your extra-hot no foam skinny peppermint latte a whole lot sweeter! Cupcoats are designed using a dual-core thermal barrier. This special combination of thermally insulating materials allows for thermal protection for your hands and a very thin profile. Cupcoats are made out of durable materials that are designed to be used over and over. The Diva and Jetset covers are made from fashion prints; the Beasts and Glamorous covers are made from faux furs, the Mens covers are made from rubberized synthetics and barkcloth, and the T-zur covers are made from waterproofed T-shirt material. Because Cupcoats have a thin profile they add minimal thickness when on your cup so they are not awkward to hold. The thin profile also allows for Cupcoats to fit into most vehicle cup holders. Cupcoats come in one size and fit most 12, 16, and 20 oz. disposable paper cups. They fold flat for easy storage in a purse or pocket. To use a Cupcoat, simply place it onto your cup as you would a cardboard sleeve. If you add a slight twisting movement as you go up the cup you will get an extra nice snug fit. Cupcoats are made to exacting standards using very high quality materials. Every Cupcoat goes through 6 quality check points to ensure your beautiful new Cupcoat meets our demanding requirements. We want you to be as thrilled to receive your Cupcoat as we are to ship it to you. The proprietary thermal insulating dual-core adds to the cost but it is worth it because it also contributes to the great structure, incredible durability, and sleek overall appearance of the Cupcoat.